Due to the new infrastructure upgrades in Chrome, my article no longer serves. You can use this article for working with Internet Explorer and previous versions of Chrome, Firefox, Safari, etc. 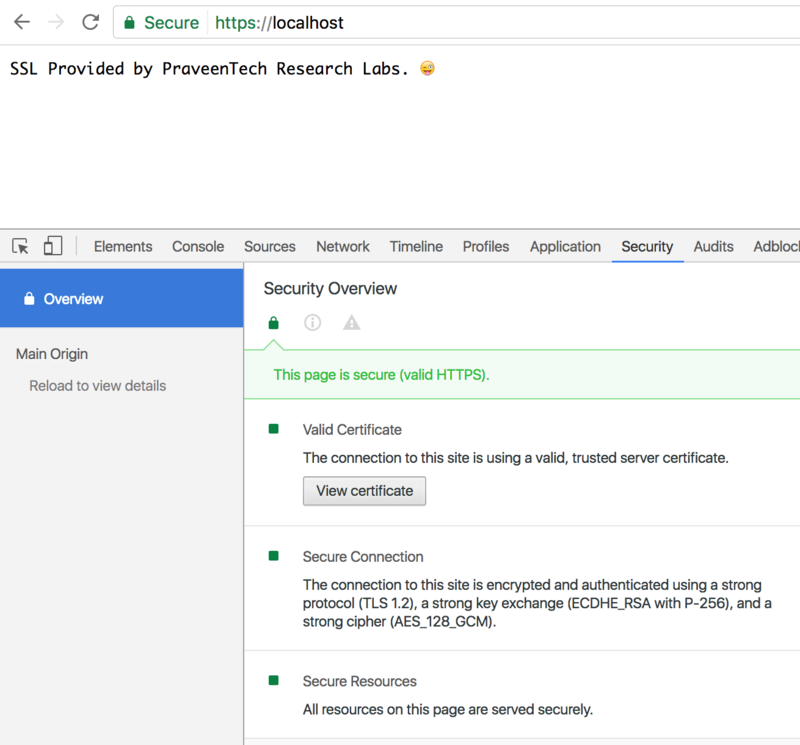 But for the updated one, please have a look at one of the best articles - How to get HTTPS working on your local development environment in 5 minutes by my close friend Daksh Shah. ‼️ Use it only locally to test things out. Don’t use this in the production environment. Privacy (stop looking at my password). Integrity (data has not been altered in flight). Trust (you are who you say you are). There are a few things you need to do to get your http://localhost secured to https://localhost and without any warning (at least in your browser). Create a Root Certificate. This is done just once. Install the Root Certificate to the Trust Repository on the client machine. Create a Domain Certificate. This is done for every domain. You need to have OpenSSL to create the certificates. This is installed with the system if you are using Mac or Linux. For Windows, please try Win32 OpenSSL. Becoming an anonymous Root Certificate Authority is now made simple. 😜 Okay, jokes apart. You can't. 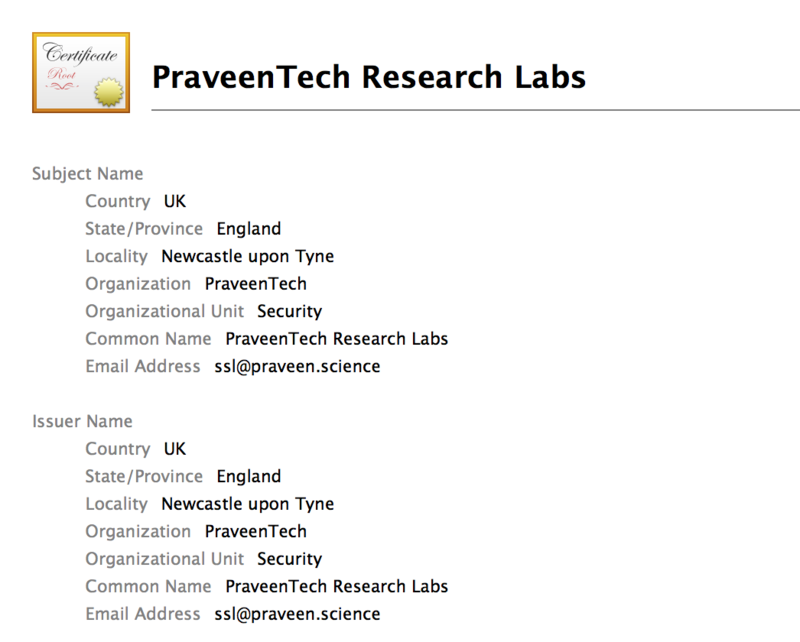 This is local to your workstation or system, just to bypass some basic security validation! This is done only once. This key is the base key. Now with this, we will be signing the others. If you want to protect the key with a password, you can do so by adding the -des3 parameter. You will be asked for a password. Make sure you use the same password to create the other keys. For Windows, you need to follow a different process, which I will post it later. And when you are using Firefox in Windows, you need to make Firefox "trust" your certificate by adding it into the repository, as Firefox maintains its own trusted list of certificates. This process needs to be done once for every domain you have. Let's say, now we are going to use localhost domain. These are the steps that are supposed to be followed. Create a 2048 bit encrypted key for localhost. After creating the key, you need to issue a Certificate Signing Request. This is the CSR, you will require to merge the rootCA and your certificate. This asks you a series of interactive questions like before. Make sure you follow this step correctly, else it won't work for your domain. Answer all the common questions like Country, State/Province, etc. but when it comes to the Common Name, make sure you give localhost. Now, with the help of the rootCA.key and rootCA.pem, we will create a certificate. You should make sure that the certificate you create should be valid for less than the validity of the root certificate. After the above process, you will have another file localhost.crt. This is the certificate encrypted with SHA 256-bit Algorithm and trusted and self-signed by you. The main file we need now is the localhost.crt, which can be installed in servers to serve the page. For now, I am going to use a simple server using NodeJS. Create a 📄 server.js in the same directory with the following contents.